What is an Epoxy Garage Floor? Although the materials are available, installing an epoxy floor yourself is a challenging project. Here are seven reasons why a do-it-yourself epoxy floor installation can fail. Always grind (or shot- blast) the surface before installing the new floor! Solvent based Epoxy products do not bond well with humidity. Make sure that â€¢ the surface is completely dry â€¢ no pipes or taps dripping â€¢ no rising humidity from beneath the ground. This happens when the Epoxy floor product is much stronger than the substrate (for example low â€“quality cement) What ends up happening is that you donâ€™t actually have the epoxy layer detaching from the cement but the cement detaching itself from the cement. 4. No (or wrong Primer) Always use suitable primer for Industrial Floors! Make sure the substrate is compatible for epoxies both in terms of adhesion as well as tensile strength. For example never coat epoxy on wood! Wood is far more flexible than epoxies which leads to the epoxy cracking simply because it cannot follow the expansions of the wood floor. Such problems occur in old installations (for example food and drinks factories, car service shops, workshops) that want to install an epoxy floor coating over the old contaminated floor. All oils, greases, residues must be properly cleaned before attempting any type of fresh coating. Donâ€™t expect proper bonding otherwise. ver seen the coating not cure properly? Did it remain sticky or soft long after the application was finished? This was caused by a faulty mix between the resin and the hardener: - Mixing incorrect or inaccurate proportions of the components - Not mixing the material properly or for a long enough time. Ultimate Garage Floors specializes in professional quality epoxy floor systems for a variety of applications including the "ultimate Garage", game rooms, laundry rooms, utility rooms, as well as many commercial applications. 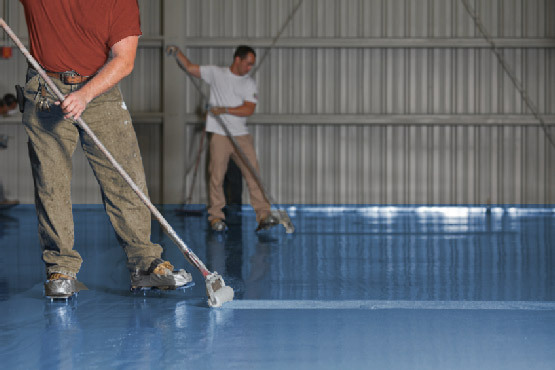 Our installers at Ultimate Garage Floors have over 30 years of specialty coatings experience, including epoxy floor systems, and other concrete coating solutions. We maintain relationships with installers throughout the Northwest: California, Oregon, Washington, Idaho & Texas. Are you elegible to view this site? CannaCopia operates in accordance to compliance with state laws regarding access to cannabis. You must be at least 21 years old, or a valid medical marijuana patient. Are you eligible to visit Cannacopia?